Hello boys and girls! I love spring the colors! Let me tell you I have such an explosion of colors just outside of the door. The neighbors must think I am a nut, because I can stay stare at a tree for the longest time. The lilac bush has a tint of w1 and B000 : ). The cardinals are so magnificent! How about the combo colors of the woodpeckers? Fantastic! So what else says it is spring time? A nice yellow dress! That is how I see my little Bildmalarna..nice yellow dress and a cool matching sneakers. Of course a whimsical butterfly came for the party too! I am just wondering to whom little bildmalarna will give that basket of flowers…YOU! Now come over Bildmalarna blog and join us for this challenge. You can win a great prize! ¤ Markers & Pens: Copics R24, Rv14, YR65, YG23, Y02, BG07, B000, B24, B34, G00, G21, G24, C1, C3, 0, multiliners and white pen. 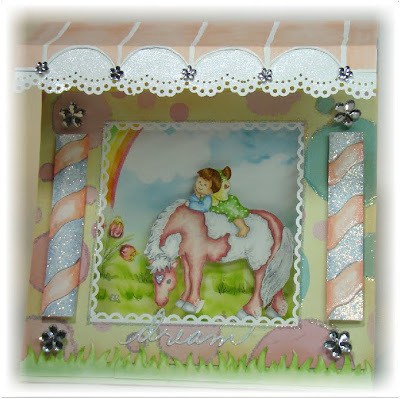 ¤ Embellishments: microbeads, glitter, glossy accents, satin ribbon, organza ribbon. Hello people! Gosh, I will spare you from what I am going thru. Just two words “ MURPHY’ LAW”. Yeap. It is all over me. BUT since I am a person that try to look to the full side of the glass here I am! The theme at Magnolia Stamp Lovers Challenge is “make a scene”… Boom! The idea just BAM! I am full of sound effects today….aahha. 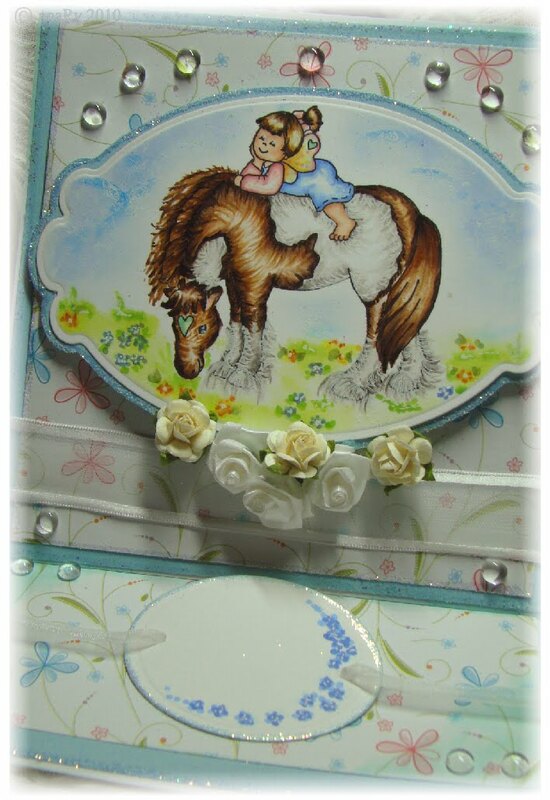 My idea for this card was to prepare a celebration scene where my dear Maggie show her creation! A cute fondant cake! Celebration without balloons is not a celebration. So I free hand some balloons with copics. I wanted to make them float plus a 3D effect so I reached for glossy accents some pop dots and floss! How did you like it? I had this glossy accents forever on my table and never used before….HA! I should not have waited so long. I am loving the stuff! Now if you excuse me I got some cake to take care of! Hellooo! 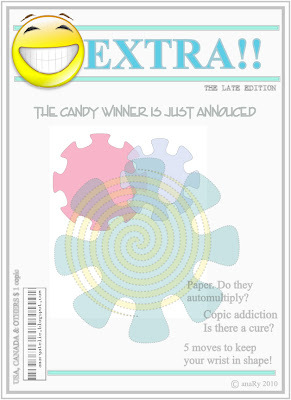 Well, so sorry about the delay in annoucing my candy winner. Real life gets to you every now and then! I have to thank each one of you that came by and dropped me the sweetest notes! It made my day! Bloggers and non bloggers that came by I THANK YOU! So how are you all doing? I have been busy with real stuff but I swear I am not neglecting my markers! I am even organizing my craft area! True! If I get the space to be decent enough I will be brave and share a picture. Should I? You tell me! I am going to have a different kind of candy next time, please stay tunned. I am still thinking how I am going to lay down the evil plan! HAHA. Okay enough...go down and give a shout out to the randomly picked winner! YAY! 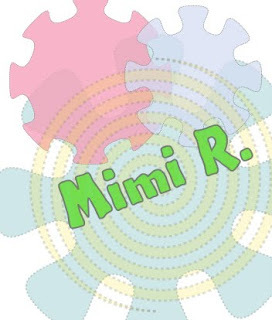 Congratulations to Mimi! Contact me to claim your prize. PLEASE put in big letters "I WANT MY CANDY" or something like that so I won't loose your claim! You got until next wed (april 21, 2010) to claim otherwise I will redraw the candy. I hope you come by! So guys stick around for an EXTRA late edition! My head is spinning with ideas for my next Candy!!! Hello all stamp lovers! Let's make this official. I am sure some of you notice my little banner on the side. Yeap, I am so happy to say that I will be having fun with sweet friends as a Bildmalarna Design team member! I am already having a good time with my dear senior dt's, they are so amazing and you bet they are preparing fantastic things for you to join the fun! 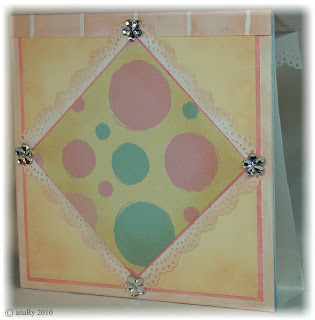 You already can join us at the current Bilmalarna Challenge blog, the theme is make an easel card. Easy and FUN! See you all . Don't forget to come by Bildmalarna challenge blog. Dont miss out on the exclusive images for the Club member! ¤ Markers & Pens: E000, E39, E15, E57, E49, E000, E02, E11, E13, E95, R000, R14, R20, R43, R89, w00, w1, w3, w5, Y0000, Y00, Y15, Y28, Y35, Y38, Y39, B0000, B23, B32, BG0000, BG05. White pen. ¤ Ink & stamps: Bildmalarna Happy Friends stamp, Memento tuxedo black, bahama, sky and pear. 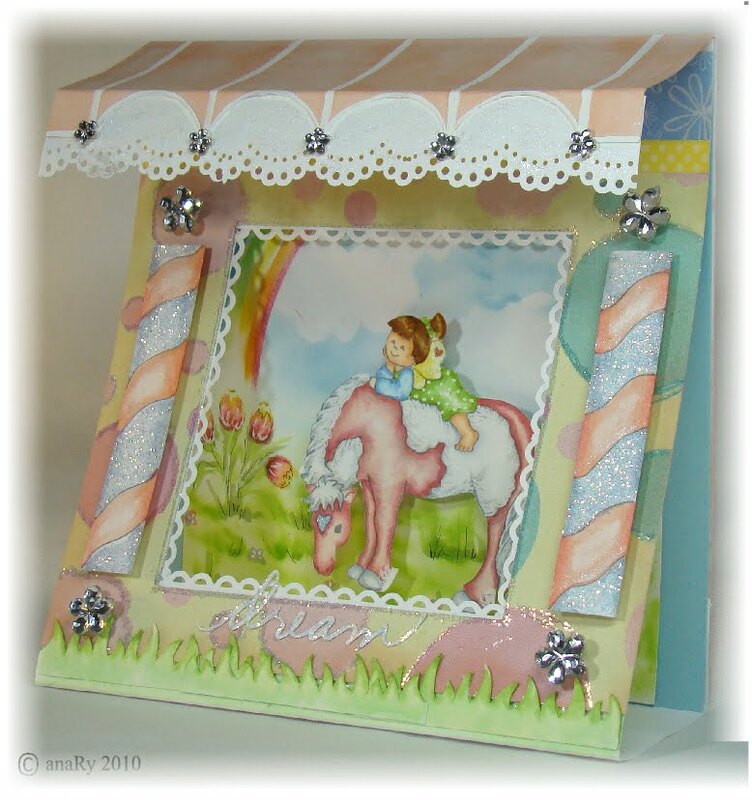 ¤ Embellishments: Mini Jewels, Glitter, Ribbon and mini flowers. 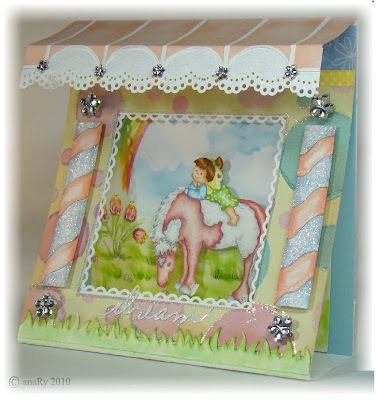 ¤ Tools: Sizzix big kick. If you like candy here is the place..few days to sign up! April 19 I pick a winner! Howdy Folks! Today I am sharing with you something that I enjoy doing sometimes. Studying. Well, what that means is practicing, trying colors, really having fun. No pressure or worries about looking for embellishments, matching papers or patterns, fooling with die cuts....NO. When I am in this mood..it is just me, markers and scrap papers...and lots of paper towel. Why paper towel? I get my fingers stained haha. So I keep a hand sanitizer (alcohol based) handy. Right now my nails got a little extra E35 on them that should not be there...hahahah. When I came across from this lovely image...my brain was flashing...primitive americana...refurbished old jeans, quilt dress, basic colors...grays and some browns...I am not sure what I think about this colored image, still a little too bright. I think I have way to go to achive the ultimate primitive look...I will keep studying...for now I am considering this an unfinished business. What do you think?! ¤ Markers & Pens: Copic E00, E11, E13, E25, E27, E35, E47, E55, B00, B18, B95, B97, YG03, YG25, YG93, YG95, Y02, Y15, Y17, YR68, R22,R39, W1, W3, 0. White pen. Multiliners. 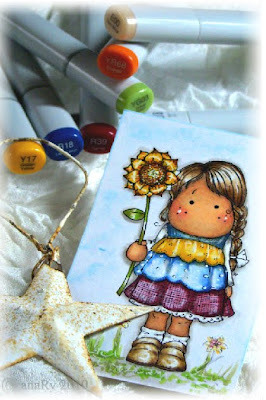 ¤ Ink & stamps:Magnolia w/ Sun Flower ; Memento Tuxedo Black. Candy candy candy? Who wants candy. Click here to try your to win so goooooods! Hello Tilda lovers! Are you enjoying the lovely spring weather? Well, people down south of the Equator are enjoying a little cooling. My parents were roasting this past season. Now I am sure they are happy! Anyway! Today I am sharing with you my lovely Petticoat Tilda and she comes dressed for the season. Sometimes I get bothered with plain color on my stamps and designs, so every now and then I try to create a little pattern. I am not sure how successful I was creating this plaid like top…I kind like the results. I think I will practice a little more : ). I opted to keep my embelishments simple because of the plaid in the background. Sometimes I feel that the card is naked without a little bling. HAHA. So, thanks to my trustworthy die cutter I was able to make my crazy idea come to life. I am not sure if I have a favorite part of this card, but if I had to choose I would pick the butterfly! How about you? Drop a note! I am so glad I have made so many new friends and learned so much this way! Oh if you have not voted for our DT friendly competition....come here and check it out my card and link for my deat DT friends! Bildmalarna friendly DT competition! Come and vote and have fun! Hello everybody! I hope you are having a lovely day full of chocolate!YAY! 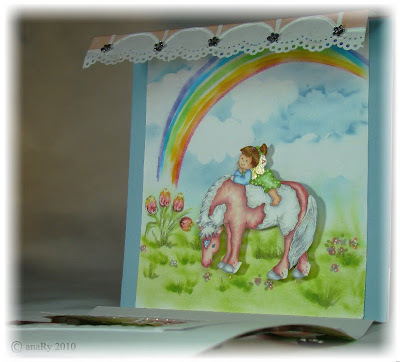 This week I had a ton of fun preparing card for a special occasion....A friendly DT competition! You see we from the DT don't receive any prizes from challenges associated from stamping scrapping....so Cindy prepared a little challenge so we could win something GOOD!! HAHHA. This is so sweet. I am loving the idea to see my colleagues creativity flourish (even mooooore!). The thing is that these girls are tough, and there is one reason: They are pretty amazing with their skills and stuff! For my card I used a Bildmalarna stamp. If you don''t know this little gal you are missing out! Bildmalarna is from Sweden and she is a sweet little thing! My idea for this card was to make a dream come true! Well, all my inspiration came to my mind as soon as I saw this Bildmalarna! My little girl looks so happy on her pony! I thought I want to give her a perfect scenario! Who doesn't dream of a pink pony and gorgeous rainbows or giant pink lollipops? I will say TGFC (copics! AHAHH). I used Bildmalarna stamp and the scenario was hand draw, for the rainbow and clouds some airbrushing with home made stencils : ). The grass I free and airbrushed. 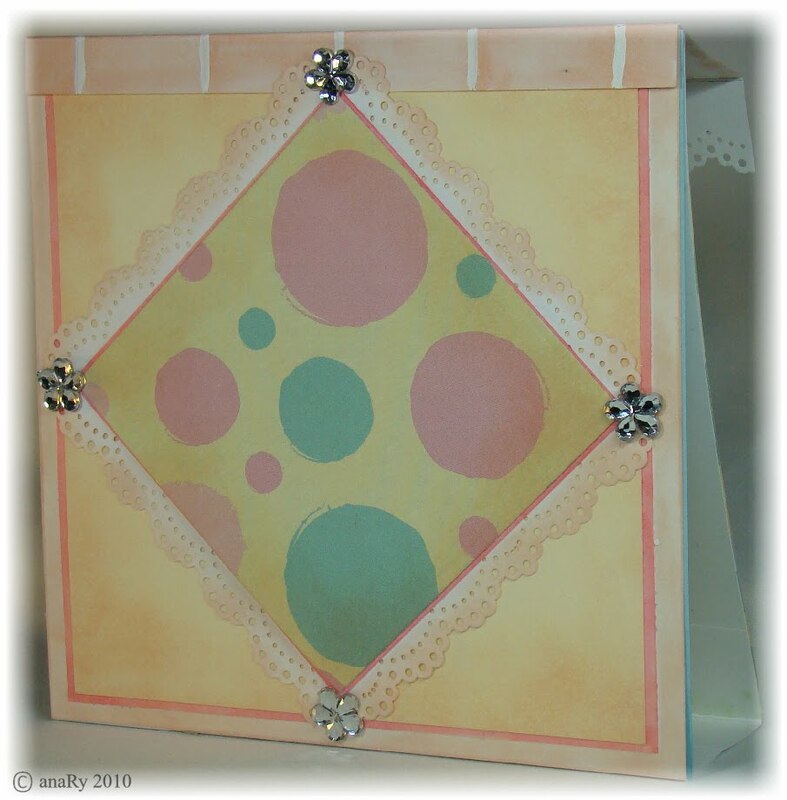 To make one of my ideas come to life the shape of a tent card was just right! Plenty of space to make my idea come to reality!! What was the idea? 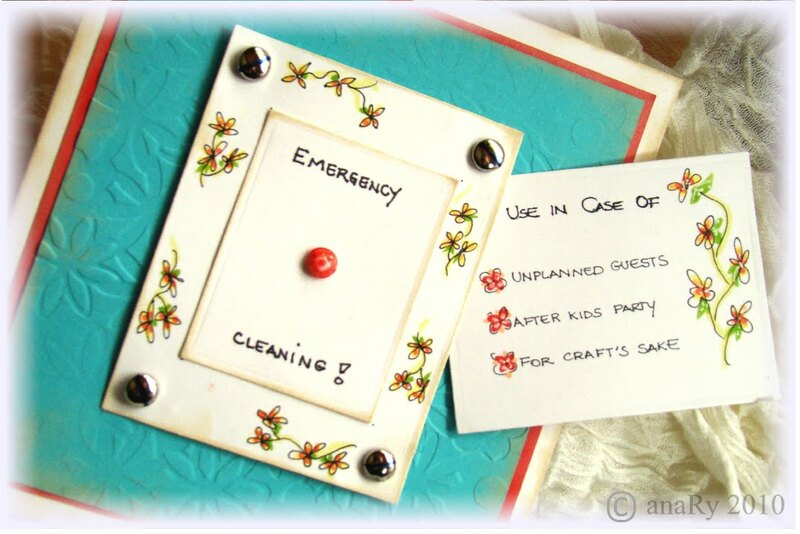 Insert little LCD lights and make this little card into a cool night light! Now....go check out my friends creations! While you are there vote for the one you like the most. I would love if you participate!! You can vote in 3 categories! Thanks for helping me and have fun! Before I go....a little peak of the back of my little card! This & That will be updated a little later today! Feel free to come back and ask questions in the shout out box at the side bar! Thanks!! !Happy holiday for all. Passover & Easter! Okay! The sun is shinning and suddenly everyone gets out of the house...the thing is that...somehow they show up at yours! HAHAH. 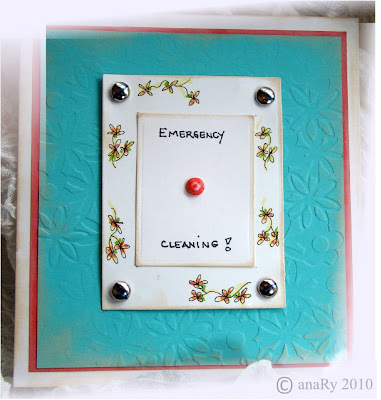 I don't know about you, but after a hard winter where procrastination reigned, I got piles of things to put away! My Kitchen! OH dear! HAHAH. I need a spring cleaning S.O.S. Thanks to my copics and a little dreammy brain. I made my wish come true. 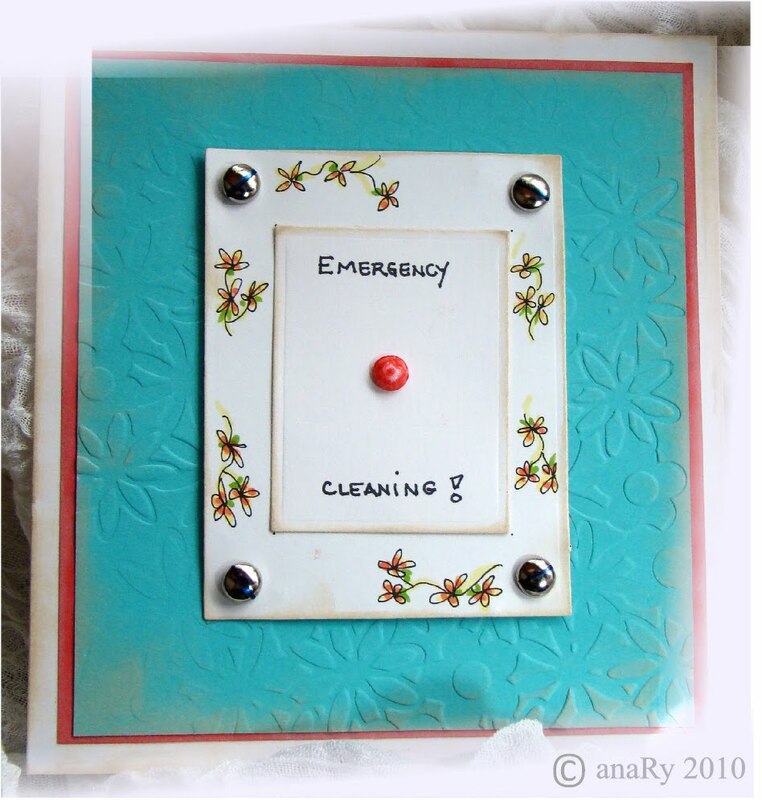 An emergency spring cleaning button. How about you? How badly you wish one of this?! 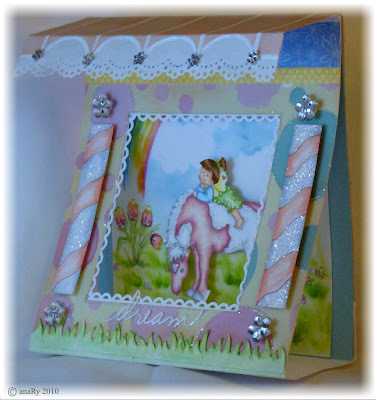 Ps: By the way I entered this card at Cinema Saturday Creative, the inspiration movie is Julie and Julia. I have not seen this movie, but I know one thing about chefs and food tv shows..WHO CLEAN THE KITCHEN AFTERWARDS heheheh! My smart button sure came to mind as soon as I saw that theme! The flowers around the switch is in honor of Nana's kitchen and that "lovely" springy wall paper (a great theme - flowers - from Copic Creations challenge)! I used the great color choices by the guidelines at copic color challenge for my doodle flowers! Love it! ¤ Markers & Pens: Copic YG 21, YG25,Y13, B39, R02, R14(subst. R17), R27. ¤ Ink & stamps: Copic multiliners. ¤ Embellishments: Dew drops, Silver brads. 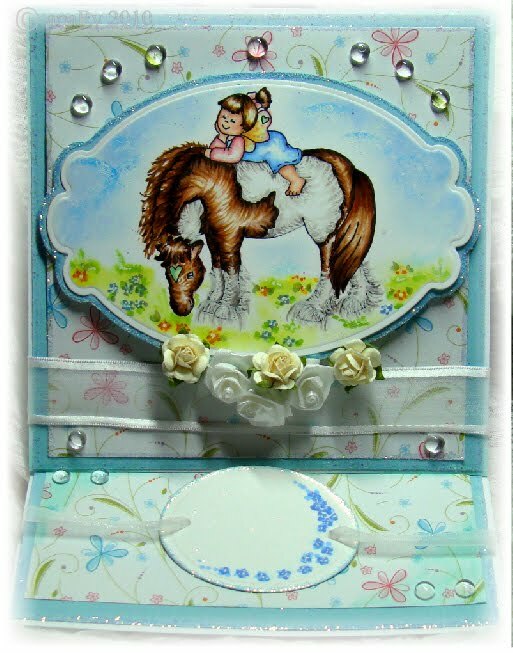 ¤ Embossing & Die cuts: Quickcutz embossing folder flowers, Nestabilities. ¤ Paper: White carsstock and color scraps. ¤ Tools: Sizzix big kick, Big bite.